Today I am unveiling my beloved grocery budget. Now I have to admit that I am not the best at sticking to my grocery budget. That is the purpose of No Spend November. To be completely honest with you, our grocery budget is never a big amount of money. 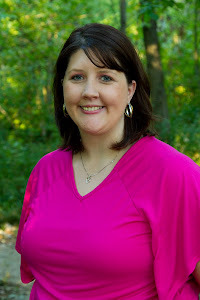 I take my family's nutrition needs seriously and I do not think it is a part of the budget that should get the ax, but I am able to feed us healthy food for a small amount of money. The reason I am able to do just that is because I am extremely blessed! First, my family has a farm in which we are given a plot of land to grow whatever we might need. I spend my summer putting up food. That is pretty much the ONLY thing I do during the summer. I enjoy it, I love it, and by the end of the summer, I hate it. BUT nothing can take the place of enjoying your own good in the winter and not having to go anywhere to get it. Second, with that family farm comes beef and venison. That is a huge chunk of change that we save. Now that does not always last us all year. With the great meat that we get (no hormones, etc. ), I am not fanatical about getting natural meats when we run out. We do NOT eat that much when we run out of home grown. Third, we eat a lot of vegetarian meals. When we eat meat, it is not the center of the meal. We have plenty of other items. I do not eat pork. Another item that costs a lot is cheese. I am not yet making my own cheese but I am heading in that direction. I buy cheese blocks when they are on sale and freeze them. That saves a lot of money. I also buy my cheese at Aldi from time to time. We drink NO soda and very limited juice. The juice we drink is made from concentrate or from home. Also, I own a Shaklee business, therefore all of our personal and cleaning products are from there. I make enough money that those products are paid for by the business. Here we go into my grocery budget: It is $150 normally. $115 for whole food store products (that includes all my spices, sugars, flours, pastas (more on that tomorrow)). $30 for all cheese, sour cream, yogurts, etc. We eat very little processed foods. Sometimes though, I just have to grab a bag of Tyson natural chicken nuggets and maybe a frozen pizza, but that's about it. Therefore, most things are made from scratch. It is a lot of work but I am blessed to be learning. How about you? How is your grocery budget broke down? Do you have a grocery budget? Please if you ever have any questions about budgeting or cooking please ask. I love to help people! 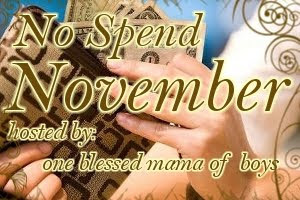 Please read here for the first day of No Spend November! I am looking forward to walking with you through your No Spend November and learning a lot!!! I have never broken my grocery budget down. I feel inspired to do so. I do spend $150 or less every two weeks for our family of 5. This includes dog/cat food, cleaning supplies and toiletries. I love coupons:) Do you use a lot of coupons? I've never broken down our grocery budget. It seems like we eat the same dozen meals in rotation so I'm always buying the same things at the store and it comes to about $75/wk. One big expense for us is dairy. We recently felt compelled to start drinking organic milk(@ $5/gallon). Yikes. We typically go through three gallons a week. Looking forward to all your tips!